Welcome to the Urban Ocean Observatory! 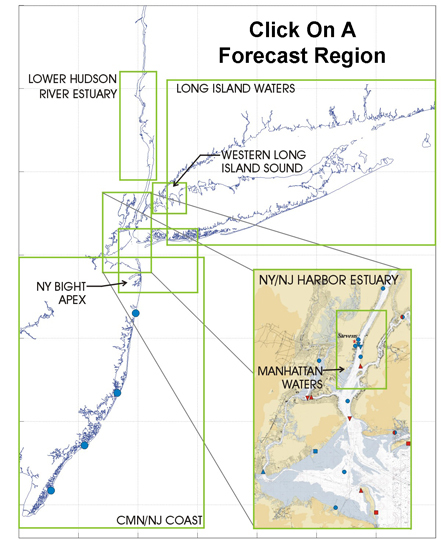 The New York Harbor Observing and Prediction System (NYHOPS) was established to permit an assessment of ocean, weather, environmental, and vessel traffic conditions throughout the New York Harbor and New Jersey Coast regions. The system is designed to provide a knowledge of meteorological and oceanographic conditions both in real-time and forecasted out to 72 hours in the Hudson River, the East River, NY/NJ Estuary, Raritan Bay, Long Island Sound and the coastal waters of New Jersey. In this web site you will see graphic images of: water level; surface and bottom temperature; surface and bottom salinity; surface and bottom currents; NOAA winds; coastal waves - height, period and direction; CDOM (Chromophoric Dissolved Organic Matter). On the forecast page, click on the red and white Question Mark for help. New service: TRACES - Forecast waterborne pollutant movement using NYHOPS and NOAA GNOME. Read about NYHOPS applications and user testimonials. An animation (built using Google Earth) of a ship moving north from the anchorage into NY Harbor and lower Manhattan may be seen here. Data administration and web development are handled by Dave Runnels. Support provided by: Office of Naval Research, New Jersey Department of Transportation. and Department of Homeland Security. A special thank you goes to the New York City Department of Environmental Protection and to HydroQual, Inc. for their permissions to use the extensively validated 3D circulation model from which the NYHOPS model has evolved. © 2006-2018 Davidson Laboratory, Stevens Institute of Technology. All rights reserved.